The US Food Safety and Inspection Service (FSIS) began applying the new regulations for Siluriformes fish on August 2, instead of September 1 as announced earlier, mandating the checking of all shipments for records, packaging and labels. Siluriformes fish include tra, basa, trê and lăng fish. The United States lags behind China as the second largest importer of Vietnamese tra fish, receiving 22 per cent of Việt Nam’s total exports of the catfish. US imports of tra were worth $220.8 million in the first eight months of this year, up 3.3 per cent over the same period last year. 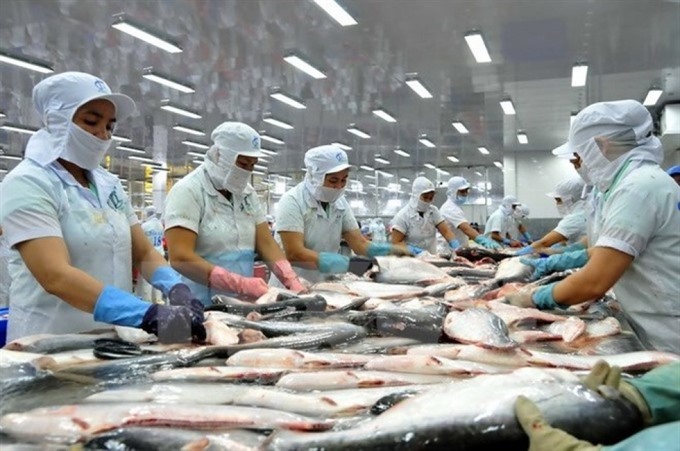 Only three or four Vietnamese firms have been able to export several tra products, including cut catfish, frozen catfish fillet, frozen rolled catfish and powdered fillets, to the US, said Việt Nam’s Ministry of Agriculture and Rural Development (MARD). A report from the Việt Nam Association of Seafood Exporters and Producers (VASEP) showed that the country earned US$1 billion in exports of seafood in the first seven months of this year, a year-on-year increase of 8.2 per cent. Although tra fish exports to EU states dropped 23.5 per cent, new markets such as Brazil, Mexico, Colombia and Saudi Arabia were seeing steady growth. According to MARD , the price of tra fish from the country’s hub in the Mekong Delta is stable at a relatively high level and is even increasing in some places. It currently runs from VNĐ22,000 (90 US cents) to 25,000 per kilo, depending on the quality and payment method. Due to the increase in prices this year, farmers have stabilised production and are now farming on an area of 4,746 hectares. In the first eight months of this year, the production of tra fish in Mekong Delta provinces reached 815,500 tonnes, up 10 per cent year-on-year. Đồng Tháp is the province with the largest harvest at 303,400 tonnes, up 25.4 per cent over the same period in 2016. According to the head of the Đồng Tháp Aquaculture Product Department, Lê Hoàng Vũ, tra fish are raised on 1.504 ha in the province, more than 809 ha of which are certified under the standards of VietGAP, GlobalGAP, Best Aquaculture Practices (BAP) and Aquaculture Stewardship Council (ASC). The province has 20 seafood processing factories with a total designed capacity of more than 467,000 tonnes per year. It has produced an estimated 180,000 tonnes of tra fish in the first eight months of this year, reaching nearly US$500 million in export turnover. The province plans to expand its breeding area to 2,000 ha by 2020, with an output of more than 541,000 tonnes per year.